I marinated the fish for 3 days. Instead of grilling, I broiled the fish in the oven (much easier to clean!). 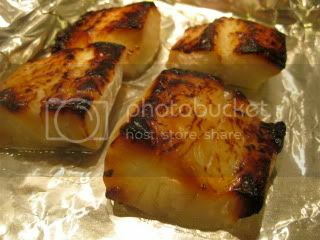 Before broiling, the marinade was rinsed off and the fish was pat-dried with paper towel. 2. Pat dry the fish with paper towel. 3. Whisk together the ingredients for the marinade. 4. 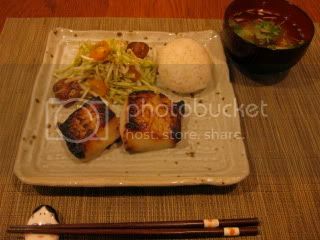 In the shallow glass container, spread the half amount of the miso marinade. Lay the fish filets so that they don overlap. Cover with the remaining marinade. 5. Cover (air-tight) the surface with plastic wrap, then cover the container with another plastic wrap or a lid. Let it rest in the refrigerator for 3-4 days. 6. Gently (and quickly) rinse off the marinade from the fish. Pat dry the fish. 7. Arrange the fish in the baking pan. Broil in the oven for 10 minutes or until the fish is cooked through and the surface has the nice "broiled" color. The fish smelled so nice with the marinade! It was so appetizing. In the same plate, I served some partially-polished brown rice (cooked with the donabe rice cooker, "Kamado-san"), and Thai-style cabbage slaw. On the side is a bowl of cold tofu soup. Jason came home a couple of hours later and had the same dish at room temperature. He loved it so much!